At 6ft 8in-tall, Elisany da Cruz Silva towers over her smitten partner, Francinaldo Da Silva Carvalho, who is just 5ft 4in. "What really attracted me was his personality, the way he acts with people and the way he acts with me," said the pretty 17-year-old. "In the beginning, I was a bit worried. I thought he could think that I was a bad person or a weird person. "But then he started talking very nicely and didn't say the type of things that people usually say to me. He was a very sweet person." She added: "The only thing that really affects us is when we hang out holding hands - it seems like he is my little brother or my son." Elisany, from the Amazon state of Para, shot to international fame in 2010 for her incredible size. 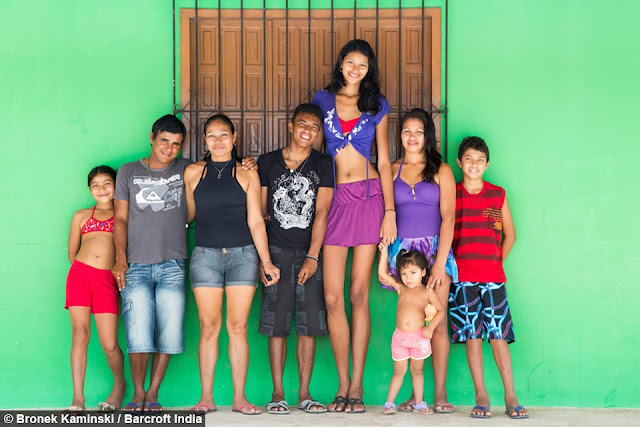 With aspirations to become a model, doctors believed Elisany suffered from of a form of gigantism and feared she would keep growing. But following treatment on a benign tumour on her pituitary gland after her story was first publicised, Elisany 'shrank' by an inch from her previous high of 6ft 9in. Her catwalk ambitions took a tumble after being told she was too tall to realise her dream. But she was soon smiling again after finding love with 22-year-old construction worker Francinaldo. Elisany, who previously dated someone for five months, said this was her first 'mature relationship'. The happy couple have now been together for a year and six months and live at her family's beachfront home. They sometimes take romantic strolls along the shoreline and kiss at sunset - though Elisany has to stoop to reach him. When they go shopping she is able to reach clothes on the highest shelves, while he struggles to grasp them. They attract stares wherever they go but say they do not care and are happy. Despite this, Francinaldo's friends constantly ask him how he could go out with such a tall girl. But he said: "I don't mind having a girlfriend taller than me. I feel free and relaxed and don't care about what people say. I am happy. "She is tall but is so pretty with a beautiful face. That is why I like her. Her body is also beautiful; her hair and her legs. "I don't feel embarrassed when I go out with her. "My friends say lots of thing like 'How do you hug her?' - I say 'There is a way of doing everything, right?" The Brazilian said he likes to go take her out for pizza or ride his moped but they spend most of their time side by side on the sofa at home. They share the house with Elisany's mother Ana Maria Ramos da Cruz, 39, brother Ronald, 11, sister Carla Laiana, nine, and stepdad Antonio Paulo Rodriguez, 27. Elisany - who is an inch taller than footballer Peter Crouch - quit school more than two years ago following teasing and because she could not fit on the bus. Her friends also said she was fed up of the 'shocked looks' she got. Now her daily routine consists of carrying out chores with her mother Ana Maria, such as sewing and cooking, while the rest of the household is at work or school. However, she has problems with doing the laundry and sweeping because the sink and brush are too small for her. Elisany spends her free hours surfing the internet and listening to Spanish music and international artists, such as Adele, as well as watching Brazilian soap operas and movies. Ana Maria said she first noticed something different about Elisany when she was 11 and began 'growing a lot faster than her friends'. But she really started to panic when, at 13, Elisany felt pains all over the body. "I started feeling desperate and asked for help from my friends who really helped me," she said. "This was the first time I took her to the hospital." "Doctors did some tests and the results really scared me because they said I could lose her at any time. "Later, we discovered the results were wrong. But I was still worried about it." Doctors found a tumor in Elisany's pituitary gland, but thankfully it turned out to be benign. She was then treated with a course of medication. The specialists now say she is physically sound except for a slight problem with her heart. However, she still suffers a lot of aches and pains in her spine, chest and knees and gets headaches. Ana Maria said her daughter has a history of being wary of making acquaintances and always 'knew how to choose her friends'. "She is not the type of girl who goes out everywhere - she is a homely girl," she added. "Her life is at home with me." Elisany, who does not have a paid job, now harbours ambitions to be a vet or work at a clothing shop and live in a big house with a husband and children. However, her ultimate dream remains to become a fashion model and despite suffering some knock-backs, she's determined not to give up after several agencies 'made promises' to her when he story was first publicised in Brazil. "When I sleep I dream that I am in a catwalk parade with lots of people watching me," she said. "I have always dreamed about it ever since I was a little girl. "But I went to some agencies in Brazil and they slammed the door in my face. "They said my height was not appropriate for what they wanted, so I gave up on it for a while. "But other people say this height is good for a photo-model. I still have some hope."